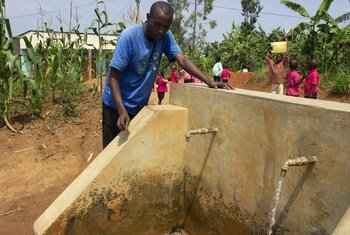 The “Green Village” concept, a Rwandan government initiative which is supported by UNDP, aims to tackle the African country’s growing natural resource challenges - including deforestation, soil erosion, access to water and unsustainable land use. It also ensures that the poorest Rwandans have access to homes, schools, water, gas and electricity. Rwanda’s impressive 8 per cent economic growth-rate in the first 14 years of the new millennium, has helped to boost recovery in the aftermath of the 1994 genocide, however 40 percent of the population still lives in poverty. People living in the Green Villages, which are located in the most disadvantaged rural areas, are provided with rain water collectors, improved sanitation, biogas facilities as well as one free cow per family. Visit Kabeza, one of Rwanda’s 44 Green Villages here.